The technology company The Linde Group will invest more than USD 200 million to build a large, state-of-the-art air separation unit (ASU), a new gasification train and supporting equipment and facilities in La Porte, Texas. The new plants are scheduled to come on-stream in the course of 2015. The ASU will be the largest operated by Linde in the U.S. and the addition of a new gasification plant will create the world’s largest natural gas based partial oxidation complex for the production of syngas products for petrochemicals. With the new plants, Linde will have a fully integrated presence in the Houston area that covers air gases and synthesis gas products production and supply to its customers. The air gases (oxygen and nitrogen) produced by the new ASU will supply the gasification assets at the La Porte site. The new gasifier will convert natural gas into syngas and constituent products such as carbon monoxide, hydrogen and carbon dioxide which are used to produce methanol, downstream chemicals and cleaner transportation fuels. In this way Linde will supply syngas products including pipeline delivery to a key customer. Linde also owns and operates three additional large, partial oxidation facilities that manufacture syngas products using Linde’s world-leading syngas processing technologies and know-how. An appeal against a controversial waste to energy and recycling facility featuring pyrolysis technology in North Lanarkshire, Scotland, has failed and the project will now go ahead. According to the developer, Shore Energy, the facility will handle some 160,000 tonnes of waste per year and be located on a former landfill site in Carnbroe. The developer then appealed the decision to Scottish Ministers who granted permission in May 2011. The council then mounted a legal challenge against the decision by the Reporters acting for the Scottish Ministers to grant planning permission, which was heard in January 2012. In September that year the challenge was rejected by the Court of Session. A subsequent appeal to that decision has now also been rejected. “We were extremely surprised (last November) when we heard that NLC were taking our successful Judicial review for a further run in court,” commented Shore Energy’s managing director, Simon Howie. “Change is often resisted but I’m convinced we will be able to take the doubters around this plant in two years’ time and allay any fears by showing them a modern, high-tech business with extremely high standards of environmental compliance,” he added. Howie added that the company will now setup a public liaison group to help secure public buy-in for the project. According to a BBC report, the judges at the Court of Session heard arguments based on European directives and the Scottish government’s Zero Waste Policy – a commitment to ensure that by 2025 only 5% of refuse would go to landfill. According to the ruling, “the council had not demonstrated that the reporters’ decision lacked the requisite validity”. Shore energy said that the project would create a £50 million investment to the local area as well as create 50 permanent jobs. New Earth Solutions, has begun producing electricity from Refuse Derived Fuel at its pyrolysis and gasification Advanced Conversion Technology plant in Avonmouth. POLL: Is waste Gasification Coming of Age? Air pollution from 196 coal-fired power stations in Beijing, Tianjin and Hebei caused 9,900 premature deaths in 2011, with the province, a big coal consumer, deserving most of the blame, according to a new study. The study looked at the health impact of burning the fossil fuel to generate electricity. The research was co-authored by Greenpeace and American air pollution experts. It also found that coal consumption in the region had led to chronic diseases, including 11,110 cases of asthma and 12,100 cases of bronchitis. Among the deaths, 850 were due to lung cancer linked to the carcinogenic heavy metals – including arsenic, lead, cadmium and nickel – from the burning of coal, while the rest were attributed to stroke, heart disease and chronic lung problems. The report has added to public concern about air pollution in the wake of the choking smog that blanketed northern Chinese cities last winter. “Seriously, it’s time to consider leaving greater Beijing,” one microblogger wrote in response to the study’s findings. Hebei is the country’s third biggest consumer of coal and was responsible for 75 per cent of the premature deaths recorded, including some in Beijing and Tianjin, the study said. It found that acid gas, soot and dust from coal-burning activities travelled across administrative borders, the study found. 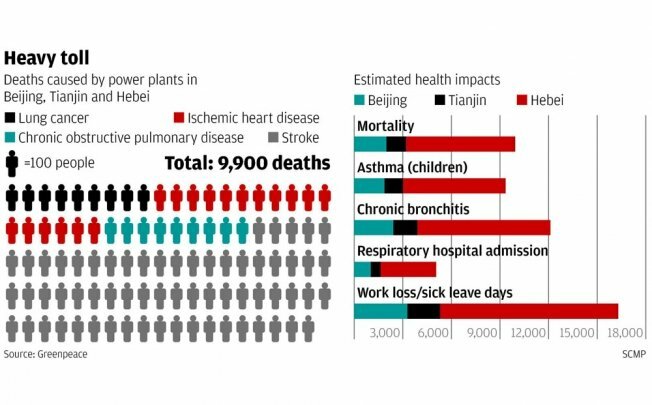 Beijing was the biggest victim, with more than 80 per cent of 1,982 premature deaths registered that were caused by coal-fired plants in Hebei and Tianjin. Beijing’s efforts to cut coal consumption in recent years had been easily offset by the enormous amount of the fuel burned by its neighbours, particularly Hebei, Greenpeace climate and energy campaigner Huang Wei said. While Beijing is struggling to reduce its annual coal consumption from 27 million tonnes in 2010 to 20 million tonnes in 2015, Hebei alone consumed 307 million tonnes in 2011. “The findings show that Beijing, Tianjin and Hebei are interdependent in terms of air quality as well as public health,” Huang said. “And each of the local governments should start to do something. New measures approved by the State Council last week did not include detailed plans to cut coal consumption nor the setting of a timetable to speed up air quality improvement in city clusters including the Beijing-Tianjin-Hebei area, Huang said. The study also showed that average levels of PM10, large particulate matter with a diameter of 10 microns, in January had increased sharply in Beijing, Tianjin and Hebei’s provincial capital, Shijiazhuang , over the past three years, despite official claims that air quality had continued to improve. The data, all from the Ministry of Environmental Protection’s website, showed the public was right in thinking that the smog problem was getting worse, Huang said. “The weather can be blamed as a reason for this trend, but I think that increasing pollution emissions should be counted as a major cause,” she said. Mainland factors will weigh for the first time in the next review of the regulation scheme that covers Hong Kong’s power firms. Deputy environment minister Christine Loh Kung-wai said yesterday that the city could not lose track of what was happening across the border when it came to energy planning. She said these factors would be given weight when the government started negotiating the companies’ Scheme of Control Agreement in the next two years. Loh did not say to what extent events in the mainland would shape the review outcome, but elaborated later that Hong Kong – which imports nuclear energy and natural gas from or via the mainland – was connected to the “mainland energy picture”. “As Hong Kong looks at its energy policy today, we should also consider what is happening on the mainland because China is developing and implementing a vast energy-related policy programme,” Loh said. Introduced in the 1960s to encourage investment in power facilities amid an industrial boom and growing population, the scheme of control ties the financial return of power firms with their investment. The existing scheme, lasting 10 years, will expire in 2018. An additional factor that will complicate the renewal will be whether the government opens the power grid to third parties such as mainland power producers, and better integrates the Hong Kong grid with that of Guangdong. Professor Woo Chi-keung, an energy economist and acting head of Baptist University’s department of economics, said closer grid integration had risks, including the impact of Guangdong’s power shortages. Local electricity use had not reached the maximum capacity of the two power firms and if the grids were hooked, Hong Kong’s remaining capacity would be “used up in a second”. Before opening up the local grid to third parties, he said, Hong Kong should consider the cost and benefits to local consumers and whether there would be any environmental impact, as letting the market decide could result in weaker regulations. William Yu Yuen-ping, chief executive of the World Green Organisation, said Hong Kong needed to co-operate more closely with the mainland on energy issues. “When we import energy from the mainland, no matter if it is nuclear energy or gas, we need to work with them so that they can plan earlier, too,” he said.